Arriving at the King Street bus depot, the place is impressive. Lined with more than 20 buses, the yard is filled with men going about their business; loading and unloading, reversing into tight corners, and having a quiet chat before heading out on their next shift. It’s also slightly intimidating, because there is not a single woman among them. I know there must be at least one woman somewhere, because I’m here to meet Lisa McGregor, one of only a handful of female bus drivers in the north-east. 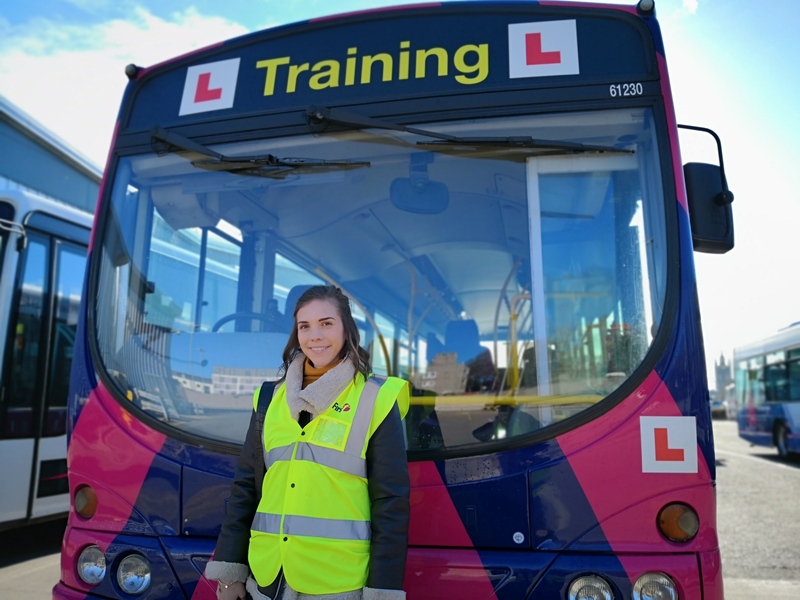 Across the region less than 10% of bus drivers are thought to be female. 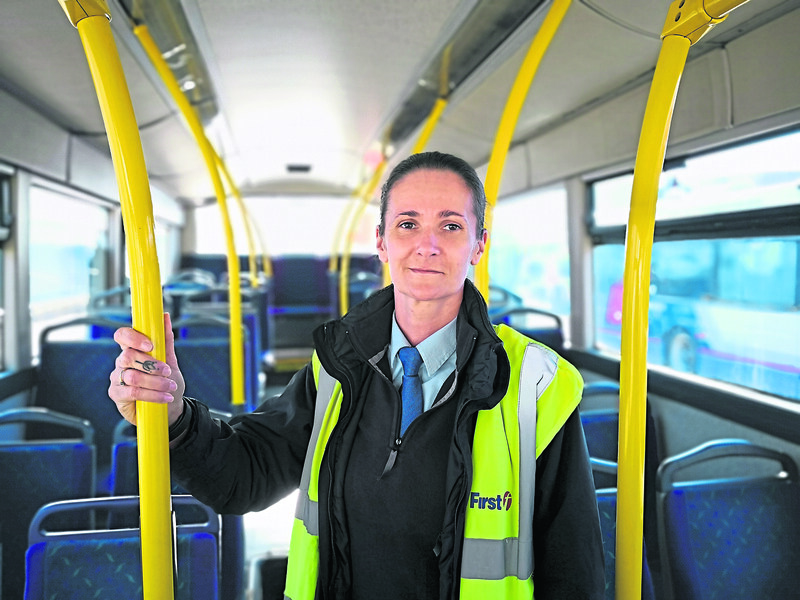 Of the 465 employees here at First Bus in Aberdeen, only 7% are women. But with a driver shortage making bosses nervous, the industry is trying to encourage more of them to slide behind the wheel. Approaching the reception I spot a friendly-looking lady nodding at me to come over. Ms McGregor has been a full-time bus driver for 12 years. But the petite, animal-loving mother from Aberdeen couldn’t be further from my idea of a stereotypical driver. Within 20 seconds of meeting, she bats away any suggestion that the roads are a man’s domain. “As long as you can do the job, then gender isn’t really an issue,” she said. Yet she was the only woman on her training course all those years ago, and just the third female driver the Aberdeen First Bus depot had ever seen. Her initial arrival at the firm raised a few eyebrows among the more stoic, long-standing drivers, who may have privately suspected that she was a “tick box exercise” by the company. But fast forward to 2019, and Ms McGregor is pleased to report that things are changing, albeit slowly. “We are seeing a lot more women come through now,” she said. Indeed, the government are taking note that women’s equal participation in the transportation sector can yield gains for all. Individual transport companies are also starting to realise that gender inequality has negative implications for their customer service and operational efficiency. In saying that however, Ms McGregor is aware that her position is still regarded as a “male” occupation. “It wasn’t like I dreamed about being a bus driver when I grew up,” she said. “I mean, what little girl does? Philippa Gerrard in front of one of the buses. Things changed when she learned to drive, discovering the freedom and sense of control being on the open road gave her. Her father – also a bus driver – encouraged his daughter to ignore the deeply embedded barriers which put many women off accessing employment in the sector. “It was very intimidating to walk into the yard for the first time,” she said. “It was entirely male-dominated and even the size of the vehicles seemed daunting. As we ease around the yard in a lumbering single-decker, Ms McGregor reveals that her 18-year-old daughter is also in training to be a bus driver. Inspired by her mother’s positive experience on the roads, she will be one of the youngest drivers ever employed by First and certainly one of the youngest female drivers in the country. Perhaps in history. Far from feeling like she is imposing on a male environment, Ms McGregor now thinks that the job is ideal for women. As well as free bus travel, drivers get decent holidays, flexible working hours and sizeable pensions and maternity packages. Although the job is intense and requires a lot of concentration, bus drivers never take any work home with them. “In my experience women can often do it better than men,” she said. “I think women generally have a more positive attitude when it comes to work, and much better communication skills to talk to the public. Challenging circumstances is certainly one way of addressing it. But slowly, women like Ms McGregor and her daughter are tackling gender stereotypes head on, proving that you don’t need testosterone to have a valid seat at the table, or wheel if you will. So, what’s it like to drive a bus? Did you know that buses are automatic? I didn’t, but it certainly took some of the pressure off as I was strapping into the driver’s seat of an 11-tonne single-decker. As a 25-year-old female, I’m not your typical petrol head. You’re more likely to see me in my battered Corsa than anything this big. But as motoring correspondent, I couldn’t pass up this challenge. Under supervision of an instructor, I looped round the King Street yard hitting a top speed of 10 miles per hour. Having your front wheels located six feet behind you tests steering skills, but (without pedestrians, passengers and roundabouts to navigate), the driving was easier than I’d imagined. At the end of my lesson the instructor was impressed with how I’d picked it up. So if this journalism thing doesn’t work out, I’ll be coming to a bus stop near you. 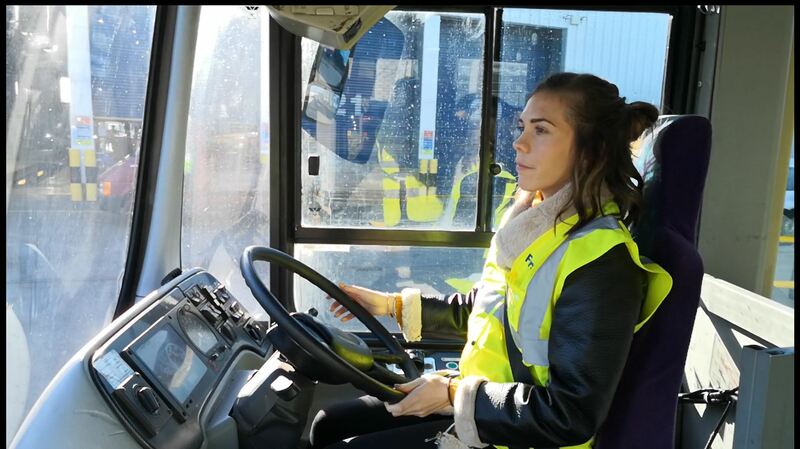 • In honour of International Woman’s Day today, First Bus are hosting a female-only open sessions today from 9.30am to 12.30pm where there will be the chance to get in the driving seat of an 11 ton bus as well as find out more about employment opportunities.